Double the fun! This spectacular Double Disco Ball Stick features two funky crystal disco balls on either end that project colourful light onto surrounding surfaces with spectacular results. Fantastic fun, this groovy flashing novelty is like a disco in your hands and is perfect for fun nights out and parties! Handle of stick comes in blue or green. 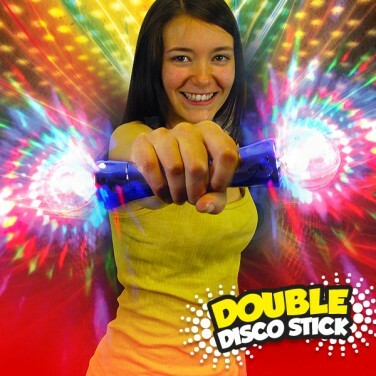 Double Disco Stick Lighten up with the super groovy Double Disco Stick! Two funky crystal disco balls project colourful light for a disco right in your hands!